Comfort food at it finest! 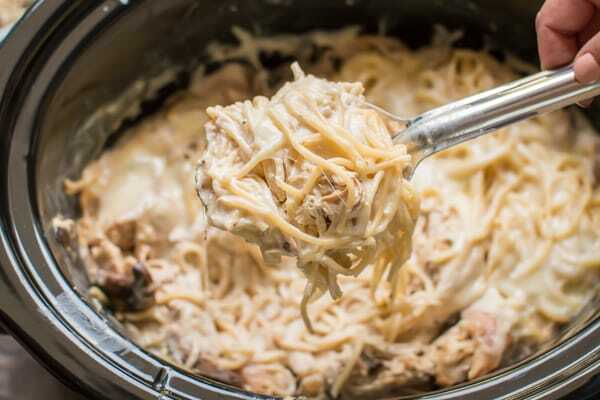 This Slow Cooker Chicken Tetrazzini is a family favorite! As you may know I mostly post dinner recipes on the blog. Having dinner together with my family is most important to me. We try as much as possible to eat dinner at the table, so finding a meal we all love makes dinner time run smoother (remember I have a very picky 6-year old). 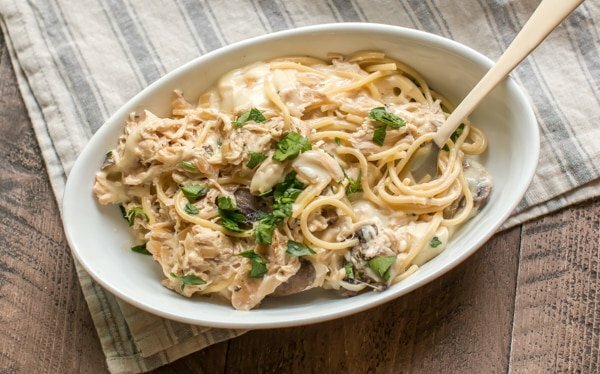 This slow cooker chicken Tetrazzini starts out with Foster Farms Simply Raised fresh chicken breast fillets. I try to find this brand for my recipes, my local Fred Meyer stocks it regularly. I love that there is never any antibiotics used and that it is always fresh and locally grown. Foster Farms has a new campaign called #thenewcomfortfood. It’s about healthy recipes, minimal ingridents and quick preparation. 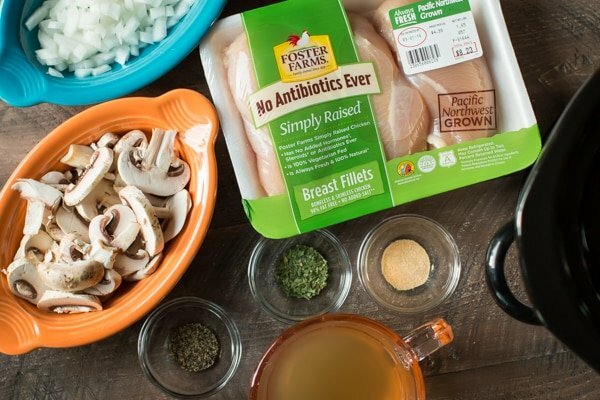 There are so many great recipes being created around this healthier concept of comfort food using Foster Farms Simply raised fresh chicken. I start by adding the chicken, seasonings, mushrooms and onions to the slow cooker. I let that cook all day. When I am ready to serve dinner, I add cream cheese, shred the chicken then stir in a half pound of cooked spaghetti. Add a bit of mozzarella and cover the slow cooker until the cheese melts. This meal is great with 1/3 less fat cream cheese and reduced fat mozzarella cheese, make it to accommodate your families diet!. What I love about this meal is that it’s great for spaghetti night, but a fresher spin on pasta. Here is the YouTube video of the making of this meal! You can follow me here. There are so many more great recipes for Foster Farms Simply Raised fresh chicken. You can see them here. Add the chicken, sea salt, garlic powder, pepper, tarragon, onions and mushrooms. Pour over the chicken broth. DO NOT ADD THE CREAM CHEESE OR SPAGHETTI YET. Cover and cook on LOW for 8 hours, or HIGH for 4 hours without opening the lid during the cooking time. Cut the cream cheese into squares and add the slow cooker, cover. In the meantime cook the spaghetti according to the package directions. After the cream cheese has had some time to melt. Take 2 forks and shred the chicken. Stir the sauce and chicken together. Add the cooked and drained pasta. Stir. Add the mozzarella cheese over the pasta and sauce. Cover for about 10 more minutes or until the cheese has melted. Serve and enjoy! be be much quicker and cheaper to cook the chicken in the broth on the hob in less than one eight of the time. I like your recipes but this one is a waste of time and money. The Crock pot takes very little energy. Recipes like this are great for people who aren’t home all day, get home and dinner is ready. Cook the chicken for less time if you want! Sarah…you were so kind to June….’whilst’ the comment may have been constructive in her eyes…it smarted a tad. One should always be capable and willing to open ones mind to another’s needs, no? Perhaps there are no crocs where June lives? Wish her well regardless…and yes, this IS a terrific idea! Whilst June Bechley finds this recipe a waste of time and money, I think this is one of those meals a family looks forward to coming home to at the end of the day! 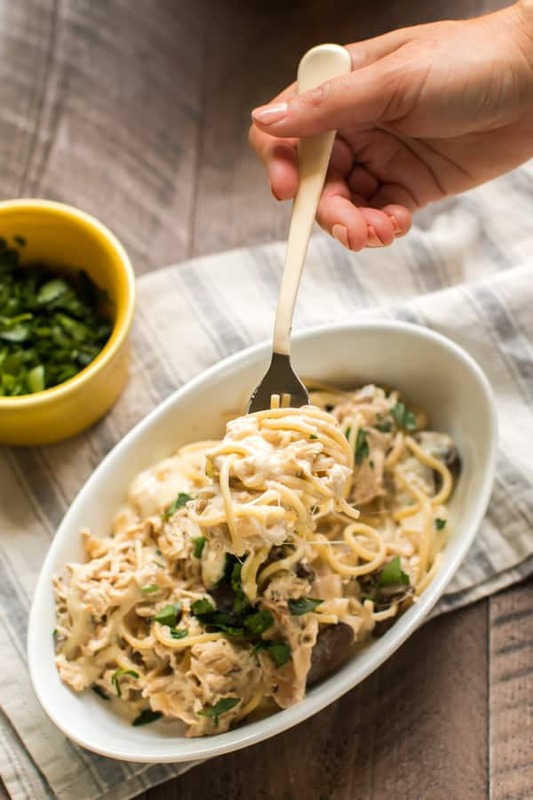 I LOVE chicken tetrazzini and this recipe looks delish! Cooking it in the slow cooker is such a great idea. What a time saver on busy nights! Just made this chicken tetrazzini recipe. Cut the breasts in smaller pieces-cooked on high in 4 hrs. Delicious! Made this last night, but used half a tablespoon of minced garlic instead of garlic powder. It’s perfect paired with an unoaked chardonnay. I will definitely have to try this one! 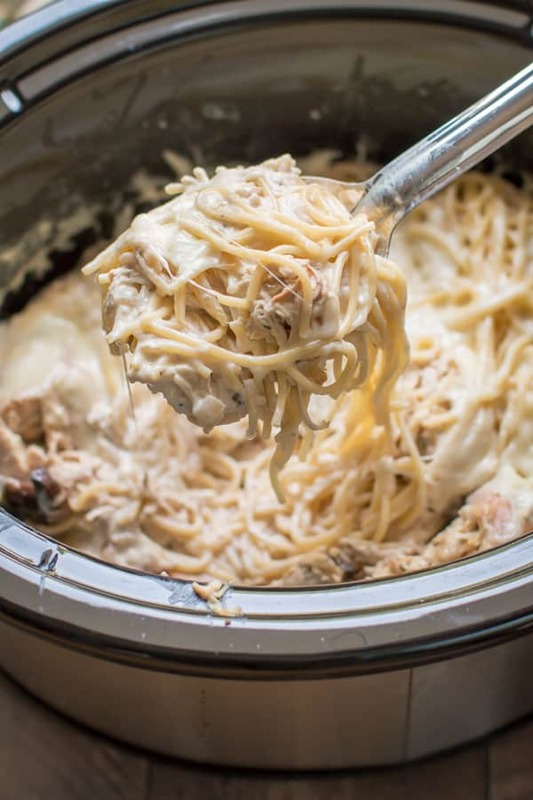 I’ve made turkey tetrazzini with leftover turkey but never in the slow cooker. Thanks for the recipe! Sounds great. I’m reducing the amount of mushrooms and tarragon as my family is no a fan but making it today. Good, but definitely needs more seasoning. I bet an herb cream cheese would be great instead of plain. Will make again! Sarah, I have a question…when you cut a recipe in half, do you reduce the cooking time? It is just me and my husband. We do eat leftovers, but do not want to eat them for days. Also, can you please make note of which recipes are good to freeze and I can make the entire recipe. I would reduce it a bit. Made this today, delicious. I did use a splash more chicken broth and an additional 1/2 blk of cream cheese. I also added a little more salt and season salt to taste b/c I do agree with above it was slightly bland initially. Could do Mrs.Dash for those that need to limit sodium and a low sodium or no sodium ckn broth. Anyway, it was warm, tasty and both my 8 yr old and 18 mo old ate it up. Happy and full kids = happy mommy. Thanks for another great recipe. This recipe is delicious! I cooked it on high for 4 hours and it was just right. Also added a bit of red chili flakes and substituted the tarragon with basil and oregano. So good! Definitely a make again! Absolutely delicious. I followed your recipe exactly. The only thing I did different is that when I mixed the melted cream cheese and shredded the chicken, I added a little more salt and pepper to taste. My husband loved it too! So great to do this in the slow cooker. We went to a movie and then came home to eat this wonderful dinner. I forwarded the recipe to a friend. 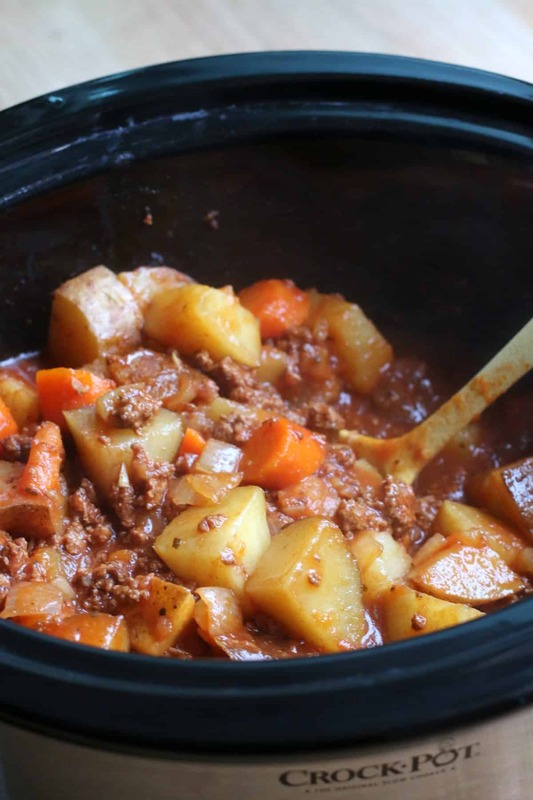 We are always looking for good crock pot recipes because they are not easy to find. BTW it is great reheated in microwave next day. I just added a little of the leftover chicken broth I had saved in the refrigerator. that is so great to hear! And yes, I agree SO good the next day, not many slow cooker recipes are! Sounds yummy and easy. I’ve always used celery salt in my tetrazzini so I will use that verses the tarragon. Thanks for the post! I added some fresh tarragon instead, about 3-4 sprigs. Chopped them up finely. I also added some minced garlic, about two cloves instead of the garlic powder. Quick hint. If you’re using fresh herbs and can only buy A LOT, chop it all up and divide them into an empty icecube tray, fill up with olive oil (I prefer flavored olive oil) and reuse whenever you fry veggies or something. Thanks for the recipe it was a huge hit at my house! Could you use a rotisserie chicken? If so, when would you add it to the crockpot ? Looks amazing. However made it today. Has absolutely no flavor. I made it today with such high hopes. I have double checked all my measurements thinking I must have done something wrong but I did everything the recipe called for. Something is just not right with this recipe. It is SO bland with way too much mozzarella cheese in it. It was so bad that I had to throw it away and cook another meal for my family. Another awesome recipe Sarah tks you..omy it was so so good.. I made as directed and really wanted to like it, but all that cream cheese just ruined it for me. The cream cheese in the sauce was just too intense. Delicious! I left out the mushrooms and used Italian seasoning instead of tarragon. So so good. Making again today for my mom’s birthday supper. Crockpot makes the best chicken and I use it even if i’m home all day (like roast).